First of all I have to say I really love when a book is narrated by the author. For me, this leads to a personal connection with the words more often than when it is narrated by someone else. 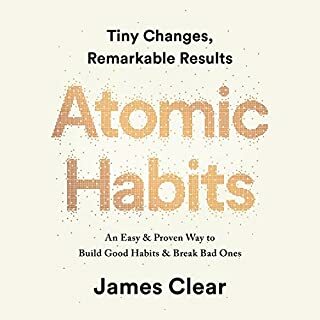 James is very easy to listen to and I was able to get through this book quickly because I didn't have to keep rewinding it (something I have to do often when a narrator is monotone and causes me to daydream instead of pay attention lol). However, the real sign of a good book for me is when I find myself sharing the lessons with my husband and friends as well as adding it back into rotation. I came across James Clear's work when I had randomly come across one of his blog posts. I was intrigued and decided that I would check out his books. Since I have a number of books that I'm currently working through and don't have enough hours in a day I thought I would purchase an audio-version of this one. I have found myself making many small changes in my daily habits. Have you ever turned over a jar to read the label before consuming the contents? That tiny little change can really make a difference in regards to your health. However, we don't always take the time to do that and to be honest in some cases I really don't want to know how much sugar/fat something has lol. My point is that we make choices every single day with how we spend our time and we don't realize that a small change (for example: reading a label) can make a huge difference. Well this book is a reminder that we can make every second count. It reminds you to pause and think about your current habits and that alone can and will lead to change.